leftValue The value at the left end of the scrollbar. rightValue The value at the right end of the scrollbar. 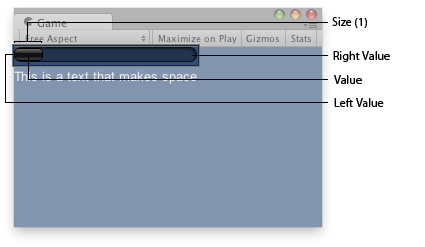 Horizontal Scrollbar in the Game View. The styles of the scroll buttons at the end of the bar can be located in the current skin by adding "leftbutton" and "rightbutton" to the style name. The name of the scrollbar thumb (the thing you drag) is found by appending "thumb" to the style name. // MyScrollbarleftbutton    - Name of style used for the left button. // MyScrollbarrightbutton - Name of style used for the right button. // MyScrollbarthumb         - Name of style used for the draggable thumb.